Currently, both the status quo of public education and the "No Excuses" Reform policies are identical. The reform offers a popular and compelling narrative based on the meritocracy and rugged individualism myths that are supposed to define American idealism. This volume will refute this ideology by proposing Social Context Reform, a term coined by Paul Thomas which argues for educational change within a larger plan to reform social inequity—such as access to health care, food, higher employment, better wages and job security. Since the accountability era in the early 1980s, policy, public discourse, media coverage, and scholarly works have focused primarily on reforming schools themselves. Here, the evidence that school-only reform does not work is combined with a bold argument to expand the discourse and policy surrounding education reform to include how social, school, and classroom reform must work in unison to achieve goals of democracy, equity, and opportunity both in and through public education. 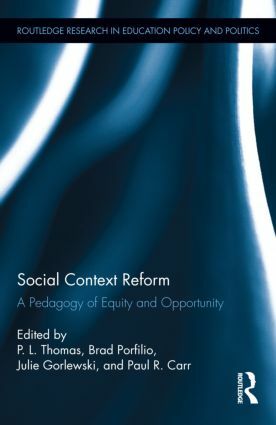 This volume will include a wide variety of essays from leading critical scholars addressing the complex elements of social context reform, all of which address the need to re-conceptualize accountability and to seek equity and opportunity in social and education reform. P. L. Thomas is Associate Professor of Education at Furman University, USA. He taught high school English in South Carolina before moving to teacher education. He is currently a column editor for English Journal (National Council of Teachers of English) and author of Ignoring Poverty in the U.S. (IAP). Follow his work at http://radicalscholarship.wordpress.com/ and @plthomasEdD. Brad J. Porfilio is Associate Professor of Education at Lewis University, USA. Recent publications include The Phenomenon of Obama and the Agenda for Education: Can Hope Audaciously Trump Neoliberalism?, which received the American Educational Studies 2012 Critics’ Choice Award. Julie Gorlewski is Assistant Professor of Education at the State University of New York at New Paltz, USA, and co-editor of English Journal. Publications include Power, Resistance, and Literacy: Writing for Social Justice (2011), Making it Real: Case Stories for Secondary Teachers (2012) and Theory into Practice: Case Stories for School Leaders (2012). Paul R. Carr is Professor in the Department of Education at the Université du Québec en Outaouais, Canada.